Back in June of 2012, the Regina Stitchery Guild held a workshop with Tanja Berlin which I was fortunate enough to attend. I had not done any needle painting or long/short embroidery before so it was quite a learning experience for me. 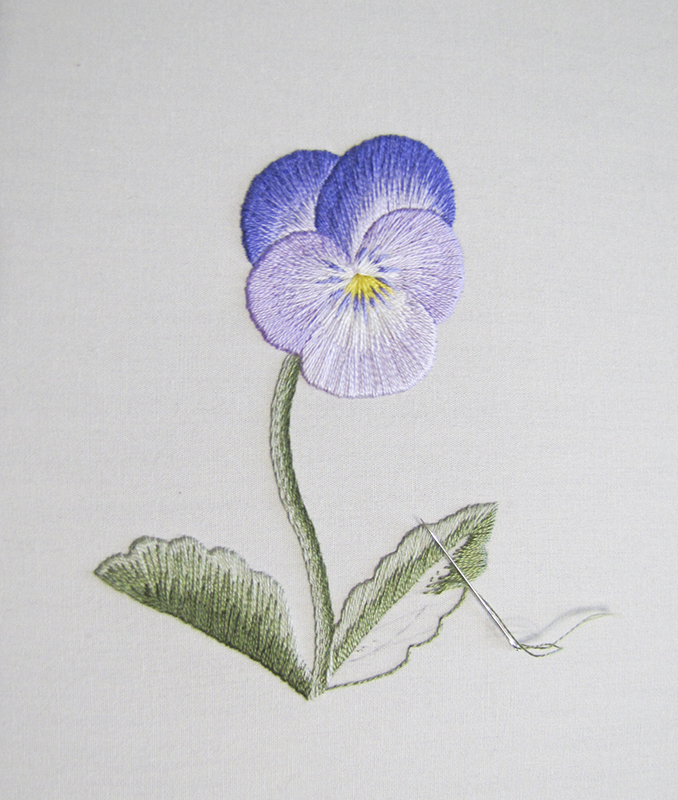 I started off with one of Tanja's beginner kits: the Bingo Clear Purple Pansy. I'm the one on the far right needing extra pointers from Tanja as she draws lightly on my fabric the correct angle lines. 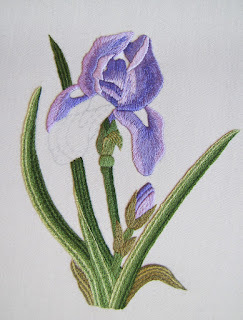 I thoroughly enjoyed learning this new and sometimes challenging stitching technique and am now slowly working on Tanja's beautiful Iris pattern. 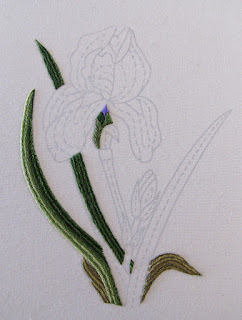 The iris leaves are all worked first in long split stitches using one thread. I was definitely looking forward to finally getting to the bud and eventually the petals. Getting the angles correct was not easy but drawing on the cloth helped tremendously. Thank you very much Beryl. 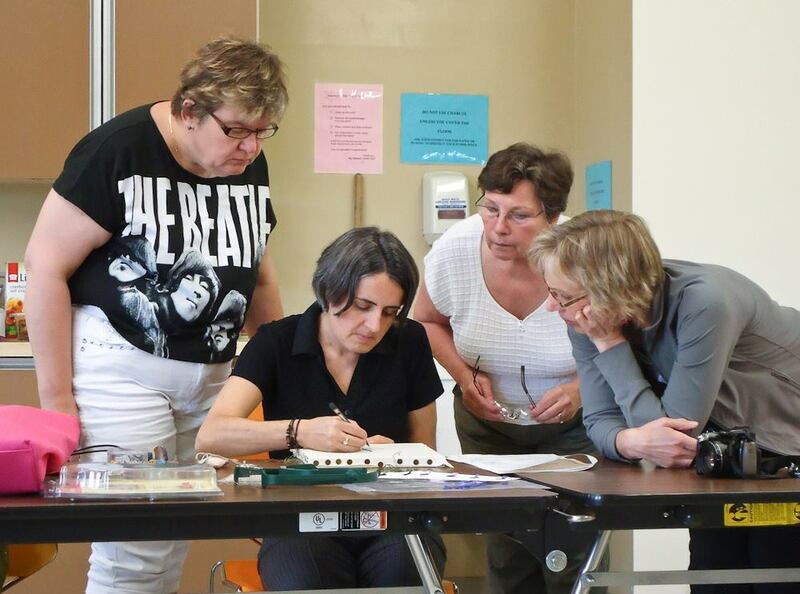 I'll be taking Tanja Berlin's goldwork lion workshop at Seminar. 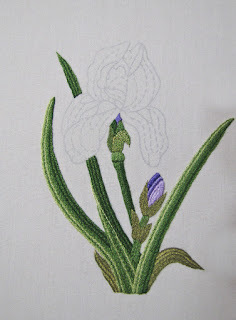 Jeanette this is looking lovely,I am sure you will have it finished in March. Congratulations on finishing your pansy! The iris is looking great too. Isn't Tanja a great teacher? I just love taking classes from her.